We have not had the pleasure of hearing from you for a long time- but what I am Now going to Communicate to you may (perhaps) induce you to favor me with a few lines.- I will therefore begin My Epistle with telling you that we are hartily tired of this part of the world- It is a Disagreeable, cold, unpleasant Climate, and every article of the comfort of life Double to what the[y] are in any Country where we have ever lived- in short there is Neither pleasure, society, nor any thing else to induce a person to live here. -- But am much at a loss to Determine which is the best place to remove to-- If I was only to consult the ease an Comfort of my wife & Myself, I would go to England immediately, But the prospect for my 2 children, is not so good there as perhaps it might be in some other part of the world. I hope to be able to give them some thing prety Handsome-- I have had Serious thoughts of going to your parts, provided I was Sure of being Treated Civilly by the Inhabitants--My annual income will support us Decently, and if I could make a purchase of a Real estate for the Child, that would be better and produce a greater profit than Money in the funds at 5 [percent] interest, I would make one for him to the amount of 1500 or 2000 sterling, which I think with 2000 were in the fund, might be a genteel support for him if he was prudent. - He is Now at College at Windsor Nova Scotia where is to remain until next August- He appears to incline to the Study of the Law But perhaps he may incline to something else by and by- I wish you would write me on this Subject and give me your [candid] opinion. ﻿Source: Mr. Murray to Francis Brinley. 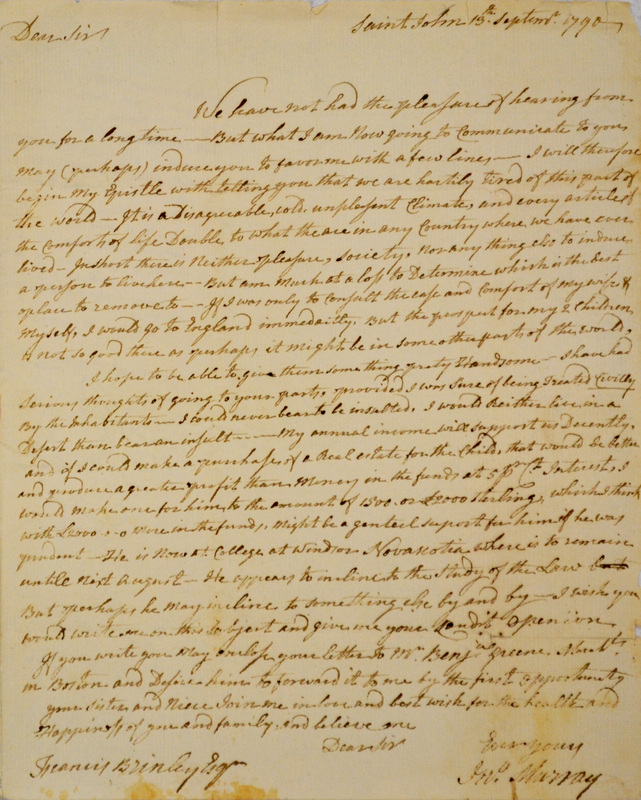 September 13, 1790. Newport Historical Society.